BPA participated in a site survey and design of temporary office swing spaces at the existing U.S. Embassy compound in Jakarta, Indonesia. The project consisted of selective and general demolition of existing buildings, construction of new temporary office buildings, and alterations and additions to existing buildings. 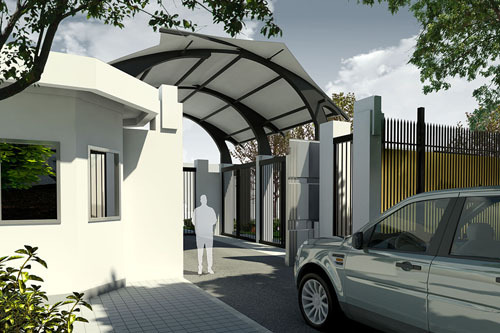 Construction of the compound swing space included a new vehicular compound access control (CAC) building including a guard booth and vehicle sally port located in a new opening in the existing north perimeter wall of the compound; a covered consular waiting area with a document intake building and handicap accessible toilet rooms building; modular trailers configured to provide men’s and women’s locker rooms; a new one-story temporary office building; building alterations and addition to the two-story café building; and building alterations to the one-story Political-Econ building. All buildings received physical security enhancements, including 15-minute forced entry and high powered ballistic resistant rated safe areas in each building.